Tax season is here, and that means that your accountants are working 12+ hour days to make sure that all of their clients are taken care of. This year, I wanted to do something special and create a Tax Season Survival Basket for the firm my husband works at! I know they all work hard, long hours, and deserve some healthy snacks to keep them powering through the day. I decided to make Target my store of choice when shopping for most of my items because I just love it so much. I can get lost in Target for hours looking at clothes, home decor, beauty products, organization products, food, etc. The list is never-ending! Once I arrived, I decided to start off by choosing my basket so that I knew how many items to get to put inside. Thankfully, that was an easy find. I found the perfect basket in the first few minutes of looking. I couldn’t wait to fill it! I went through Target and quickly found everything that I needed & got in the checkout line. I thought I was done shopping, but I saw Extra® Gum Spearmint and Extra® Gum Polar Ice which I knew I had to include in my basket! I love that it was so easy to find in the checkout line – I didn’t even have to lose my spot! You can also save 10% during February on New Extra® 35-stick pack, so definitely take advantage of that coupon offer through CartWheel. I don’t know about you, but when I need a little pick me up without the extra calories, I choose gum. I thought the New Extra® 35-stick pack was perfect for the Survival Basket because it features more gum than your typical package. If they have meetings with clients, they can give give the clients gum, as well. Give Extra, Get Extra! I also love that there is enough gum in the pack for you to split it between your desk, purse, or wallet. It’s convenient, no matter where you are & what you are doing. When picking my items to go inside the basket, I really wanted them to be not only as healthy as possible (for the most part), but also environmental friendly! I chose mostly packaging that could be recycled, or packaging that was made from recycled products. For example, the Extra® Gum Spearmint and Extra® Gum Polar Ice is made from durable, recycled packaging! Ian and I recently started recycling, so this was extremely important to me. The basket came together perfectly! I am so proud of the work that I did to make this happen. Hopefully the products in it will keep all of their accountants happier this tax season! Look below for my tutorial on creating the basket! – Make sure you basket is large enough for what you are wanting to do, and also physically appealing! Step 2: Find items that will help your accountant power through tax season. Step 3: Fill the basket with tall items in the back and shorter ones to the front. – As you can see in my pictures, I folded down the very top of some of the bags so that you can see what is behind it, and I also placed the taller items in the back. Step 4: Deliver your basket to your favorite accountants! – My husband is taking over this task for me! He is bringing the basket with him to work, and I’m so excited for them to see it! 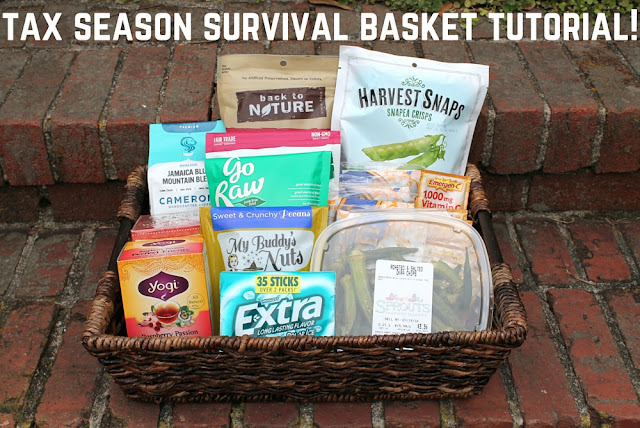 Are you interested in creating a Tax Season Survival Basket with healthy snacks and New Extra® 35-stick pack? It is the perfect way to thank your accountants this year!